First settled in the 1880's, and still a working cattle ranch, the Rhynard Ranch sits high in the rugged Castle Mountains of central Montana. With 3000 acres of private land and thousands of acres of adjoining National Forest, the ranch offers a sublime opportunity for hunting, recreation, and relaxation. Your headquarters will be the completely refurbished and fully modernized, 104-year-old ranch homestead cabin -- located a secluded half-mile from the main ranch. From there, you'll hike, hunt, camp, watch birds, photograph wildlife, XC ski, snowshoe, or fish ' all on your own. Or, if you're into pure relaxation, sit on the front porch and read or write a book, sketch or paint, soak in the scenery, or watch the wildlife that passes by and above. 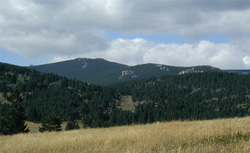 Rising to 8,500 feet, the Castle Mountains project the impressive rock turrets that prompted their name. They hold a well-hidden glacial lake teeming with cutthroat trout, creeks full of brook trout, and abundant wildlife. Whether you want plain solitude, excellent hunting and fishing, a scenic and challenging winter XC experience, or summer recreation in a spectacular, isolated setting, the Rhynard Ranch is the place for you. Directions: Rhynard Ranch Recreation directions available on web site: http://rhynardranchrec.com.